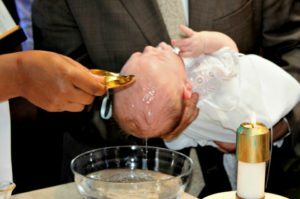 Membership in the Church is conferred by the Sacrament of Baptism. Jesus commands us to “Baptize all nations in the name of the Father and of the Son and of the Holy Spirit.” (cf. Matthew 28: 19) Saint Thomas the Apostle parish invites everyone to Baptism and membership in the Church. Please call the parish office to make an appointment for the Baptism. Contact the parish secretary at (773) 324-2626 or staparish@aol.com. Download a Baptism Request Form. Baptisms are usually held during (or after) the 11 a.m. Mass on the first Sunday of the month. Parents and Godparents are required to attend a short class before the Baptism. This is usually held on the second Sunday of every month after the 11 a.m. Mass. Adults who wish to be baptized, confirmed and make their First Communion are asked to join the preparation program. The Rite of Christian Initiation of Adults (RCIA) prepares you for Christian Initiation each year at the feast of Easter. For more information, please contact Jennifer Davis at jennifer@stapostleparish.org or (773) 324-2626 x102.